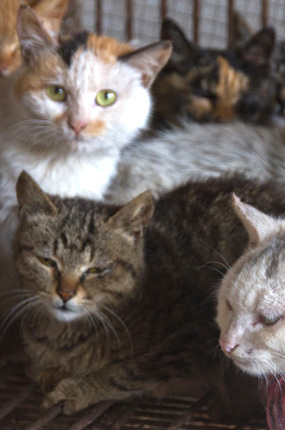 The Beijing authorities required that the city’s restaurants sell no cat or dog meat for the duration of the 2008 Olympic games. Following the Olympics, the consumption of these types of animals diminished and now, there are few places left in the city that serve these types of meat. The Dong Hua Men market, in the centre of Beijing, is one of them. 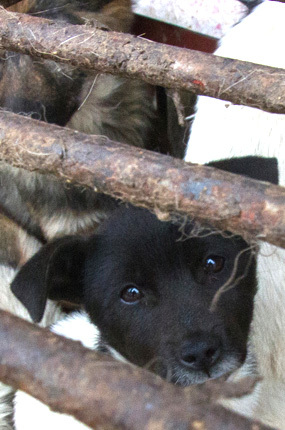 We found two stalls which offered us dog meat by saying to us, in English, « dog, dog ». Another stallholder taught us how to prepare cat meat with flour, whilst imitating the meowing sound of a cat. We arrive with our translator at around 8 in the morning. We stayed in Jining, not very far from the farm. The people we stayed with were waiting for us in a car and we followed them to the farm which was just outside the city. Once inside, they took us to an office where we discuss business for nearly an hour. We tell them that we wish to make a weekly purchase of a large quantity of dogs that we will then process in our new meat facility in Guangzhou. They assure us that they can provide the number of dogs that we require. We persuade them to show us the installations and the condition of the animals, since we need to have a good knowledge of our future suppliers. We are shown two warehouses, one of which holds around ten large dogs, in separate kennels. In the entrance to one of them is a bucket of oatmeal. That is all the food that they have. These are the adults used for breeding. We see Samoyeds, greyhounds, Alaskan Malamutes and crossbreeds with American Staffordshire terrier, German shepherd and Shibu Inu origins. It seems that they spend a lot of time in enclosed condition and they bark at us non-stop. Many of them seem to be looking to us for affection, and others barked nervously. One of the dogs, which looks like a German Shepherd, clearly has injured back paws and is unable to get up or even pull itself along, and it looks at us with interest. Another dog still has a collar around its neck, from its previous owners. These dogs have been stolen from families in the area. Through what we witnessed and conversations we had with our translator, we now know that this network has a criminal faction whose role is to steal dogs from their homes and from the streets. Questioned directly about their capacity to provide us with the number of dogs we require on a weekly basis, they confirm that if necessary they would conduct searches in the region for street dogs. They themselves would take care of sending them to us. In the other warehouse there are approximately 150 puppies of only several weeks of age. 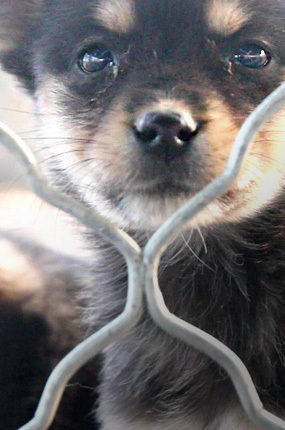 We notice several wire cages on the ground into which puppies are crammed. The cages are approximately 80cm wide by 40cm tall and 20cm deep. We count up to 13 puppies per cage. 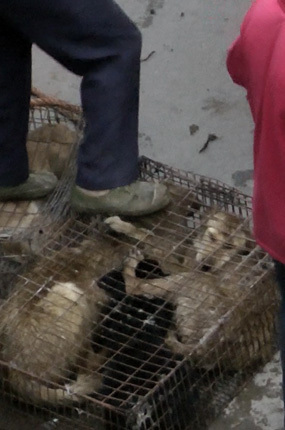 We are told that these puppies are sold at 3 weeks of age to another farm where they are fattened up until they reach the weight requirement, or else, they are slaughtered here – by stabbing, without being stunned beforehand, as it is explained to us – or they are taken by lorry to one of the other slaughterhouses they deal with. One of us, accompanied by the translator, distracts the farmers with a barrage of questions whilst someone else uses this opportunity to film as much as possible. Before we leave, we ask once again to be given another look. We feel that we are taking a big risk by asking and forcing the situation in this way, so that we can film some more, but we consider that now that we have succeeded in infiltrating this group and have got this far, we need to be sure that we have enough material. We can’t go away without getting this. The farmers don’t seem to suspect anything. In any case, the two investigators established a series of key words which, once pronounced by any one of us, allow us to communicate the level of risk of the situation and to act accordingly. One of these words would serve as an instruction to get out immediately, losing no time whatsoever. Before coming to China we contacted various activists who had investigated this business in the past. The most experienced of them told us that he had stopped investigating these places several years earlier. It was too dangerous. He warned us that we could end up stabbed and dumped in a ditch. In this farm, in the middle of nowhere, I remember what he said and try to remain calm and act in accordance with our cover story. Keep moving forward. This is our only option. Yesterday we visited a farm in Jining and one of its owners offered to be our intermediary in the area. He made it clear that if we want to but dogs in this area, he would take a cut of each sale. We insisted that we wanted to see other farms in the region and so today he takes us to a farm in Jiaxiang. In the entrance of this farm is a huge wall display with photos of the dogs that are bred, in the style of a catalogue. At its side, we discover one cage with nine puppies inside, curled up on the wire floor and the excrement. They are being exposed to show the products that are available to us. The owner takes one of them and holds it up to the camera. Through a fence we see the kennels where the large dogs for meat can be raised until they reach 90kg in approx 5 months. Although its ‘production’ equates to 80 dogs a week, these people also assure us that they can sell us as many dogs as we want. We leave, saying that we will be in touch. After visiting the farms at Jining and Jiaxiang we have decided to travel to Wuhan. Two local activists accompany us to a market where there is a business with exotic animals for sale. There is a large amount of caged live animals such as deer, alligators, rabbits, raccoons, hedgehogs, a porcupine, quail, donkeys and geese. There are fifteen dogs distributed in two cages, all of them puppies that are only a couple of months old. The dogs are dirty and laying in their own excrement. We do not know how long they have been there. On top of a cage there are a pair of large pincers which are used to grasp them by the neck and take them out of their cages without running the risk of being bitten. We observe that at least one dog has been killed that very morning since its skin is laying over one of the cages. In one of the baskets we can see a burnt dog’s skull. Despite watching the stall for various hours, no more dogs are sold that morning. 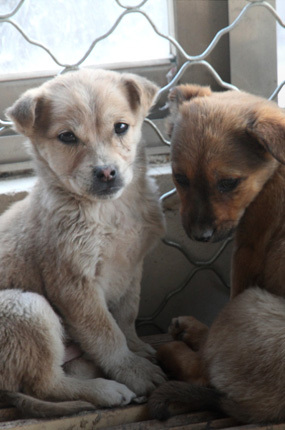 They tell us the sale of dog meat in April is very low and that winter is the best time of year for them. It is around two in the morning. We enter the market accompanied by a local activist and try to keep the security guards from noticing us. Westerners draw a lot of attention in all the places we go to. At the entrance there is a sign forbidding the use of cameras. The three of us are carrying hidden cameras on us and we are determined to film how the dogs and cats are unloaded from the trucks transporting them. Each night various large trucks arrive at the market carrying hundreds of dogs and cats from other regions of China. Some of these animals have travelled for more than 24 hours across thousands of kilometers, afraid and with nothing to eat or drink. The market employees crowd around one of the trucks and we stand among them naturally. We smile and we even say a few words in Chinese. The employees are in a hurry so they ignore us and let us watch them work. There is a moment one of us is able to enter the kennel the dogs are in and records the unloading of the animals from the inside. The animals are forcefully thrown and, despite their injuries and the poor state they are in, none of them bark. We suppose this is because of the fear and, perhaps, they might have had their vocal cords cut. We have the images we wanted to record. After half an hour security guards appear and harass us. They want to know if we have cameras on us. Our local contact talks to them while we ignore them and try to act normal. These are some very tense moments since we are completely surrounded by these people. They make a lot of money from this business and they know there are people, like us, that are trying to put an end to all of it. Maybe they are wondering if we are not that type at that very moment. We decide to leave before the situation becomes even more complicated. We wander the area surrounding the market during the morning and find, to our surprise, around twelve crushed kittens. Some have been crushed with such force it is hard to recognize them. We deduce that these kittens were born in the cages that their mothers were being transported in inside the trucks and that they died that same afternoon when they were thrown against the ground. Other cages, loaded with other cats probably fell on top of them. We found this in two zones. When we film at the new Three Birds Market entrance, two guards on motorcycles approach us. They try to intimidate us to get us to stop recording but we know they have no authority so we ignore them and they finally leave. A few hours later we return to the zone and watch the market for three hours. Around seven o’clock that evening we observe a medium sized truck loaded with rabbits that stops near the market’s secondary entrance, under a highway bridge. Posted about 100 meters away and thanks to our camera’s zoom, we are able to discover that these transporters are carrying more than a hundred dogs in their truck, hidden among the rabbit cages. For a few minutes, we film how they throw the cages from the top of the truck before we decide to approach them. We walk up to the highway and, crouching, manage to position ourselves right over them without being seen. We start filming and taking photographs of how the animals are unloaded while barely managing to look through the viewfinder in order to avoid being discovered. The animals, crowded in the cages, are terrified and can barely move. Due to the size of the cages, they have to stay lying down the entire time as they are being thrown from the truck against the floor. 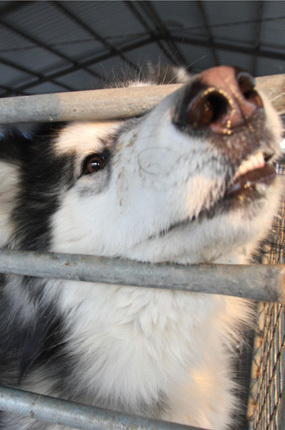 We can hear the dogs’ cries of pain when they hit the ground. They cry out from broken bones, concussions, and open wounds… Once they are on the ground, they are piled up, weighed and transferred onto another truck that we think will take them to the slaughterhouses in the zone. We approached a container near the market and found a lot of dog hair. We know that in some areas in China they remove the recently killed dog’s hair (just like they do in other countries with pigs for example), so this finding indicates that there is a dog slaughterhouse nearby. One of the local activists who has joined us indicates a place with a big metal fence that seems to be the place we are searching for. We inspect the back of the property by climbing on the wall and we see what appears to be an underground slaughterhouse. We arrange with the activist who is joining us that we will contact the authorities to obtain the closure of this place. It’s four-thirty in the morning. We have barely slept for two hours but we want to take advantage of this trip to its fullest. We go to the stands that are selling dogs and cats in the Three Birds new market. We walk by the security guard, who is half asleep and seems unaware of our presence. There is no one around, it seems to be one of those dead hours that the customers have not yet arrived. We take advantage of this to videotape cats and dogs who are watching us with fear. One of the dogs is wounded and is limping noticeably. Another, with the collar still around his neck, walks to the metal bars of his cage looking for us. From time to time someone comes and looks at us with curiosity and some concern. We continue to document the situation of these animals and, after an hour, when the rest of the vendors start to appear we decided to leave. Thanks to the information provided by local activists we know that in this city there is at least one dog slaughterhouse and we suspect there may be more. We decided to investigate by asking the local taxi drivers who are the ones, after all, that know the area well. Finally one of them leads us to a neighborhood where there is a slaughterhouse. This slaughterhouse is located a few meters from a residential building. Children walk right in front of it with their backpacks, on their way to school. After several hours establishing a friendship with the neighbors and the butcher, we convince him to allow us videotape him that day. Without warning, he enters the building and closes the door behind him. We can’t follow him but we know what is going to happen. He enters the room where he has the dogs locked with a stick in one hand and a pair of pliers in the other. We record through the gap between the door and the ceiling how he hits one of the dogs. He throws a heavy blow at him. Two. Three. Opens the door and drags out a camel colored dog. The dog is paralyzed but still alive. The butcher, calmly and smiling at us, grabs a knife, steps on the dog and stabs him in the neck. The blood starts to gush. The butcher takes him by the back legs and hangs him upside down while the dog bleeds out. After a few seconds he throws it on the floor. The dog breathes with great difficulty, he has no more strength. It will take almost four minutes for his eyes to become glassy. The butcher returns into the building and again tries to close the door behind him only this time we are prepared to follow him closely and we go inside with him despite his complaints. He closes the door again and opens the next one where the dogs are kept. We try to move around and document what is happening without scaring the dogs any more. We see they have no food or water and that the ground is a mass of smelly faeces. They try not to look at his face … they don’t even move. It would seem they are trying not to draw attention to themselves. They know what is going to happen. They have seen it before and no one wants to be next. The butcher walks around the room observing them, assessing to himself which one he is going to choose next, which one has the right weight for today’s customer. Finally he grabs one by the neck and hits him in the head several times. He drags him and stabs him onto the slaughterhouse sump, in the street. A child approaches attracted about our presence and plays with his ball around it with normality. The process is repeated with several other animals. Another child, older than the previous one, approaches the slaughterhouse and observes the situation. He looks at the dogs agonizing and bleeding in front of him. His expression tells us he is questioning what he is seeing.